With five classic albums and sales of over 4 million, A Tribe Called Quest solidified their place in hip hop history. This is a comprehensive collection of 11 groundbreaking videos that propelled the group to stardom in the 1990's. 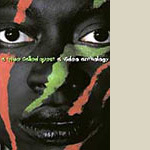 Complete your ATCQ collection with this DVD and rediscover some of the most innovative players who were on the forefront of the rap movement in the Golden Era. A surefire party pleaser!